Drawing on recent feminist and psychoanalytic criticism, Cinzia Sartini Blum provides the first analysis of the rhetoric, politics, and psychology of gender in the avant-garde writings of the Italian Futurist F.T. Marinetti. Her book explores the relations between the seemingly unrelated goals of Italian Futurism: technical revolution, espousal of violence, avowed misogyny, and rejection of literary tradition. 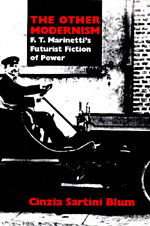 Blum argues for the centrality of the rhetoric of gender in Marinetti's work. She also investigates a diverse array of his futurist textual practices that range from formal experimentation with "words in freedom" to nationalist manifestos that advocate intervention in World War I and anticipate subsequent fascist rhetoric of power and virility. A major contribution to the study of the twentieth-century avant-garde and the first full-length study of Marinetti in English, The Other Modernism will interest all those concerned with twentieth-century literature, culture, and society and the problem of modern subjectivity. Cinzia Sartini Blum is Associate Professor of Italian at the University of Iowa.